A 20 year masterplan for Royal Holloway, University of London, securing the principle of development within the Green Belt, and within the grounds of the Grade 1 Listed Founder’s Building, generally regarded as the finest Victorian educational building in the Country. Stride Treglown prepared a new 20 year masterplan for Royal Holloway, University of London between March 2013 and January 2014. The masterplan underpinned an outline planning application for a comprehensive development scheme including a net increase of academic accommodation totalling c.55,000m2 and an additional c.71,000m2 of student residential accommodation (c2,650 beds). The campus is a previously developed site predominantly within the Green Belt. The outline planning application was accompanied by an Environmental Statement and was resolved to be approved in January 2015. The planning permission decision notice was issued in April 2015, enabling the first reserved matters submissions for 620 student study bedrooms to be submitted: this scheme has since been approved and construction has started on site. Not only did the outline planning application secure the principle of development within the Green Belt, but also within the grounds of the Grade 1 Listed Founder’s Building, generally regarded as the finest Victorian educational building in the Country. Royal Holloway has a significant and notable positive impact on the economy, particularly in Runnymede and the wider Surrey economy. The impact of their activities also makes a positive contribution as part of the network of Higher Education Institutions throughout the UK. In addition to its positive contribution towards the local economy, RHUL performs an important community role, offering accommodation and sporting facilities for use by local groups and clubs, library services to the general public and small scale retail and quasi-retail facilities on-site such as a convenience shop, bank, laundry and licensed premises. Their Picture Gallery is considered of national importance and open to the public, as is the Chapel. RHUL organise concerts and public performances and hosts presentations and lectures available to the public. The masterplan will result in further social interaction within Egham, Surrey and beyond. The main campus accommodates a transient daily population comparable to a market town, yet has limited on-site retailing and student centred facilities. 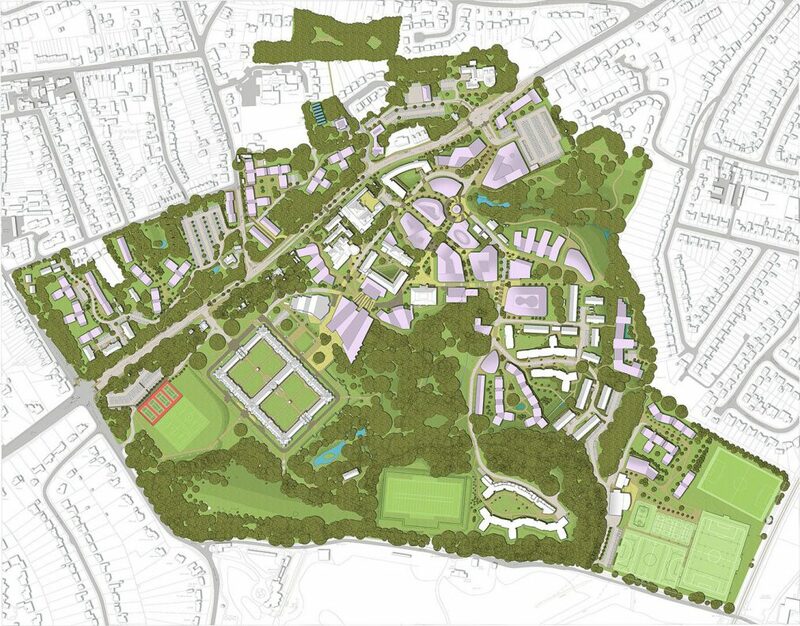 During the masterplanning process we developed a land use strategy which removed cars from the heart of the campus – the first time since the introduction of motorised travel on-site – offering a more attractive and pedestrian friendly environment to encourage connectivity, congregation and student services focussed activities. This transformation in access movement and parking results in conservation gains to the Founders Building, not expected at the time of our appointment. Since the masterplan submission, we have been invited to consider detailed design responses for a new and innovative museum which has the potential to become home to a nationally important historical asset. The masterplan has been developed within a sensitive heritage and environmental setting, involving development within the setting of a Grade 1 listed building and with the majority of the site located in the Green Belt. As an adjunct of the Initial Site Analysis Report Stage, we worked with the University to interrogate, support and present university space and utilisation benchmarking to hone their accommodation brief and therefore inform the end state, and phase 1 of the masterplan. We considered initial development impacts and mitigation measures, including quick wins in relation to water management and biodiversity gain. Masterplan revisions were prepared to reflect changes in the brief, both generated by the client, but also the Planning Authority in relation to minimising green belt impact. Changes involved the relocation of some 11,000m2 of student residential accommodation from a current playing field site within the greenbelt to locations within the main built up area of the campus (90% of the relocated floor area) with the residual floor area moved to a site north of the A30 beyond the Green Belt boundary. This change also facilitated a detailed enhanced sports pitch proposal to come forward within the green belt and which has since been developed and now contributes towards university and community life in the area. During the planning application preparation process, we worked with RHUL to devise and execute two rounds of public consultation, supplemented by local resident group meetings. Consultation and engagement, involving both on-line and manned exhibitions, raised both awareness of the University’s Plans, and informed changes to not only the masterplan proposals, but also the long term management objectives and regimes. Stride Treglown was commissioned by RHUL to run an open and competitive tendering process to appoint a team of technical consultants to assist the masterplan endeavour. We approached, briefed and evaluated tender responses and, following their direct appointment by the client, managed and reviewed their performance. We held Design Team Meetings and, via Programme Programming Tools, EIA drafting guidance and regular verbal and written progress reports, built constructive relationships. A series of 5 overarching design principles were created early in the commission, including a remodelled heart adjacent to the Founders Building, maximising that part of the Campus Estate located outside the Green Belt for student accommodation, a new peripheral car parking strategy and a new access strategy. The Masterplan includes early development projects including the enhancement of the University’s Sports facilities and playing pitches, various refurbishment projects and acts as an important stepping stone to facilitate a new 10,500m2 Library adjacent to Founders. The masterplan supports RHUL’s commitment to Carbon Reduction through setting sustainable development aspirations and targets. 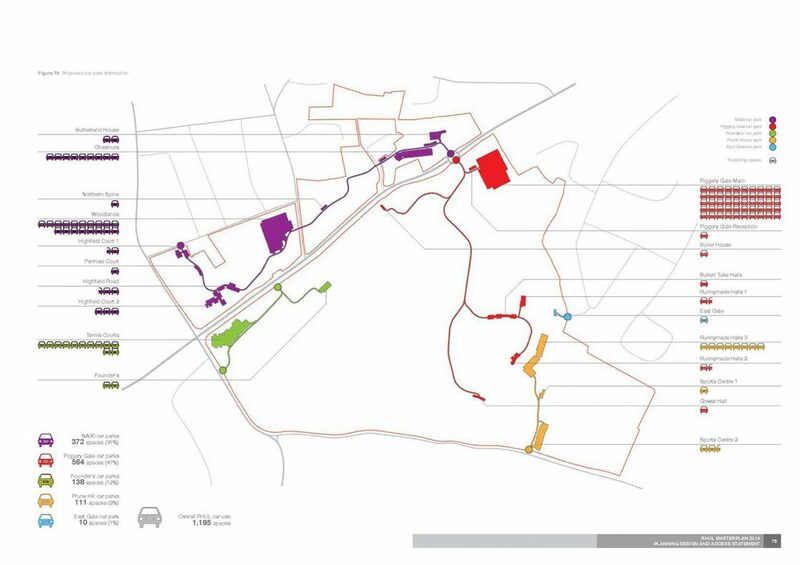 Greater integration of all parts of the campus into the daily life of students, staff and visitors to the campus results in a better distribution of building footprints and an enhanced pedestrian and cycling network throughout the estate. The masterplan makes provision for an integrated landscape and ecological management strategy for the site with the goal of generating a net bio-diversity gain. The 20 year time horizon masterplan is built upon a principle that redevelopment of existing developed plots will occur over time. RHUL wished to devise a spatial framework rather than a prescriptive end-user defined building programme. The framework allows the university to devise flexible approaches to faculty expansion and co-location. The masterplan refers to opportunities across the campus for new buildings to deliver flexible centrally managed spaces and bespoke learning environments. Impact on Transport has been a concern of local residents during the masterplanning process. Changes to parking, entrances and car free zones are integral to the spaces we have sought to create and are key to achieving set transport targets. These elements are interwoven with all aspects of the Masterplan. The Transport Assessment demonstrates that the proposed changes will not increase parking demand. This approach was been carefully considered and accepted by Surrey County Council and formed part of the requirements of the s106 agreement. RHUL Travel Plan targets are considered achievable based on successes by other Universities in similar settings. We employed a masterplanning approach which we have developed with Universities over a number of years. Our approach is broadly divided into three phases; initiation (Initial Site Analysis Report), formulation (Strategic or Concept Options Report) and completion (Development of the Preferred Masterplan). This design management approach involved a lead consultant with masterplanning project management expertise to coordinate the processes of gathering information, managing and controlling consultations and ensuring that programme objectives are met. Despite considerable environmental and heritage constraints, and quantum of development proposed, Runnymede Borough Council (RBC) granted planning permission. Focused preparation in advance of a series of pre-application meetings with RBC and Surrey County Council, (“SCC” – Highways Authority) enabled a clear Schedule of Deliverables to be prepared, including voluntary EIA and a corresponding Scoping Opinion. Stride Treglown coordinated the preparation of the Planning Design and Access Statement, and managed, part prepared and collated the Environmental Statement. Deferred at Planning Committee, we are currently working with RBC and SCC to resolve local parking concerns. Stride Treglown has developed a successful partnership with RHUL over 14 years and we consider ourselves to be a trusted advisor. We have designed and delivered over 1,000 student study bedrooms on-site as well as the Windsor Building (Lecture Theatre and general teaching), and recently, a large Boiler House Refurbishment project to deliver flexible spaces and an auditorium. The first projects generated by the Masterplan – the first 620 study bedrooms and new 10,000m2 Central Library have been secured and are on-site. “Royal Holloway appointed Stride Treglown in Feb 2013 to lead on development of our Masterplan, including urban design, planning advice and coordination of the work our of technical sub-consultants for production of the EIA. With Graham as Project Director, Paul as masterplanner and Andrew leading on planning law and heritage issues, their coordination of the work involved was formidable and inspiring. As the client, we have found the team from Stride Treglown to be very responsive to our needs whilst ensuring we understand the constraints we have to make decisions within – be they physically relating to the site, or deadlines resulting from our programme. Their sensitivity to the environment in which we work and their understanding of the differing needs of our stakeholders was well understood and delivered on through their attendance at projects boards, public exhibition, private residents consultative meetings, senior management workshops, VIP events and planning meetings. When we appointed Stride Treglown we already had a draft masterplan developed in 2009. A lot had changed internally and externally since that draft was produced and we had a greater understanding of our spatial requirements within our greenbelt campus. Stride Treglown listened to the shortfalls we saw in the 2009 draft, incorporated our aspirations and ideas for the campus and took time to visit the site in person, get to know it and make suggestions that we hadn’t seen or thought of ourselves. Stride Treglown win ‘Town Planning Consultancy of the Year’ award!